Genuine OEM Lexmark Toner Cartridge, Magenta, High Capacity 5,000 page yield. Lexmark part number: C5240MH, C5242MH. Color Laser Toner Cartridge compatible with Lexmark C524, C532, C534. Remanufactured Lexmark Toner Cartridge, Magenta, High Capacity 5,000 page yield. Replaces Lexmark part number: C5240MH, C5242MH. Color Laser Toner Cartridge compatible with Lexmark C522, C524, C530, C532, C534. Remanufactured Lexmark Toner Cartridge, Cyan, 3,000 page yield. Replaces Lexmark part number: C5220CS. Color Laser Toner Cartridge compatible with Lexmark C522, C524, C530, C532, C534. Remanufactured Lexmark Toner Cartridge, Cyan, High Capacity 5,000 page yield. Replaces Lexmark part number: C5240CH, C5242CH. Color Laser Toner Cartridge compatible with Lexmark C522, C524, C530, C532, C534. Remanufactured Lexmark Toner Cartridge, Magenta, 3,000 page yield. Replaces Lexmark part number: C5220MS. Color Laser Toner Cartridge compatible with Lexmark C522, C524, C530, C532, C534. Remanufactured Lexmark Toner Cartridge, Yellow, 3,000 page yield. 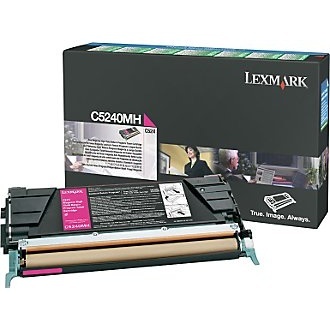 Replaces Lexmark part number: C5220YS. Color Laser Toner Cartridge compatible with Lexmark C522, C524, C530, C532, C534. Remanufactured Lexmark Toner Cartridge, Yellow, High Capacity 5,000 page yield. Replaces Lexmark part number: C5240YH, C5242YH. Color Laser Toner Cartridge compatible with Lexmark C522, C524, C530, C532, C534. Remanufactured Lexmark Toner Cartridge, Black, 4,000 page yield. Replaces Lexmark part number: C5220KS. Laser Toner Cartridge compatible with Lexmark C522, C524, C530, C532, C534. Remanufactured Lexmark Toner Cartridge, Black, High Capacity 8,000 page yield. Replaces Lexmark part number: C5240KH, C5242KS. Laser Toner Cartridge compatible with Lexmark C522, C524, C530, C532, C534.